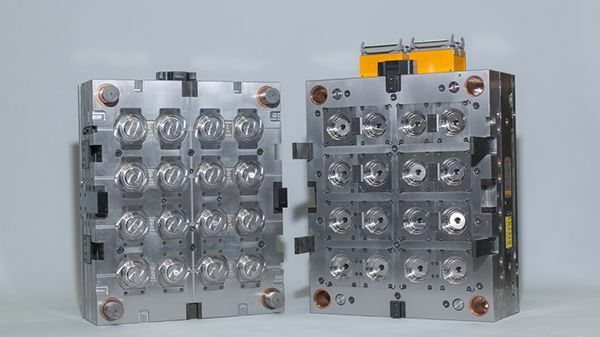 Injection moulding a product is not possible without the appropriate mould tool or ‘suite’ of tools. In most cases, tools have a moving half and a fixed half, one containing a cavity and the other a core. It is the gap between the core and cavity that is filled with molten plastic. Water channels within the ‘walls’ of the tool are used to control the rate at which the plastic cools and solidifies. Tools are constructed from a series of mould plates. Back plates (bolsters) are used to clamp each half of the tool to the moulding machine platens. Onto these are attached items such as cavity/core plates, ejector plates (and their mechanisms) and dowels that guide the two halves together when the tool is ‘closed’. The rear of the fixed half of the tool also contains a sprue bush. This is a round plate with a radiused depression containing a central hole that runs to the mould cavity. The nozzle of the injection moulding machine is pushed against the bush to create a leak free seal when plastic is injected into the tool. Tool plates are available in a variety of grades. Aluminium plates are usually used for prototyping or low volume production. Pre-hardened steel plates are suitable for medium to high volume work, whilst grades such as P20 tool steel are first machined and then hardened to provide ultimate durability. Where more complex shapes of plastic part are being produced, the use of moving side cores is sometimes required. These move into and out of the cavity to create features such as holes in the side of a moulding. This movement can be powered either mechanically (generated by the tools opening action) or using hydraulic cylinders that are controlled by the moulding machine. Tools can have a single impression, produce multiple identical mouldings at a time (multi-impression) or a group of non-identical mouldings (‘family’ tools). Molten plastic is distributed to the cavity/cavities via a runner system. The runner system can either solidify and be ejected from the tool together with the moulding (a cold runner or ‘sprue’), or a hot runner system is used. A hot runner system uses electric heating devices to keep the plastic within the runner in a continuous molten state. A small pneumatic or hydraulic device ‘pinches off’ the runner just behind each cavity once filled. This leaves a small ‘pip’ of material at the injection point. Unlike with a cold runner, there is no requirement for trimming/separation as a post moulding operation.